1. Where did goldfish originate? 2. Why are goldfish orange? 6. How long do goldfish live? Goldfish are domesticated members of the carp family and their scientific name is Carassius auratus. 1. Where did goldfish come from? Native to China and first domesticated during the Tang Dynasty from 618 to 907 they were initially raised and maintained for food in freshwater ponds. However during the Song Dynasty from 960 to 1279 the Chinese also placed them in containers for ornamental display. 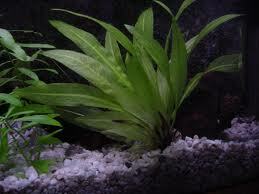 These may very well have been the first aquaria. Most carp are dull colors like tan, brown, and grey. This is because they are bottom dwelling fish and these dull colors enable them to blend into the environment to escape predators or to hide from their prey. However a color mutation ranging from yellow to orange-red occurs naturally in carp populations. The Chinese began to ‘select’ the orange colored carp when rearing these fish and this is how we came to have the domesticated gold carp, now commonly called goldfish. Apart from color, other traits have been selected over the decades and we now have more than 120 varieties of goldfish. These types include the popular Fantail goldfish, Shubunkin, Bubble Eye goldfish, and the interesting Celestial Eye goldfish with telescopic bug eyes and a double tail. Other color variations include the Jet Black Moor goldfish with telescopic eyes and Pearlscale goldfish with long lines of beautiful pearl-colored spots. All of these various goldfish varieties are still the same species even though they may look very different. Goldfish care is relatively easy compared to other domesticated fish. In fact all you really need to start off is a small fish tank and some fish food especially formulated for goldfish. You really don’t even need aquarium filters and pumps but if you don’t you have to be careful to change the water frequently. If you don’t change the water frequently and don’t have a good filtration system, the water becomes oxygen depleted and your goldfish will suffer or even die. This is the reason most people invest in a good filtration system. Feeding goldfish can be trickier than you think. In nature all carp are opportunistic omnivores. This means they eat whatever they can and whenever the opportunity arises. They eat both plants and small invertebrate animals. Because they’re opportunistic feeders in nature, it’s natural for them to keep eating as long as food is available. Domesticated goldfish retain this trait so they have a tendency to continue eating as long as there’s food in the tank. This can kill them as their digestive system can become compacted if they eat too much. It’s important, therefore, not to overfeed goldfish. Goldfish and other carp are gregarious in nature, meaning they travel in schools. If you maintain a large enough aquarium to accommodate several goldfish, you can enjoy watching your goldfish exhibit schooling behavior. 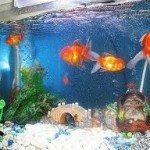 The most aesthetically pleasing way to keep goldfish is to use at least a 20 gallon aquarium equipped with aquarium filters and pumps for oxygenating the water and filtering out wastes. In this way you only rarely have to change the water, and even then, you only need to do partial changes. If you include some aquatic plants and an overhead light, you’ll have a beautiful aquarium that can serve as a mesmerizing centerpiece for any room. Just keep in mind that algae will grow on the sides of the aquarium with the overhead light turned on all the time. As the algae builds up, it can make an otherwise beautiful aquarium unsightly. A solution for controlling algae is to buy some snails or algae eating fish to live with your goldfish. They’re quite efficient at keeping the algae under control and live quite happily alongside your goldfish. Read more about the efficiency of including algae eaters in your tank here. The Japanese often keep larger goldfish called Koi in Koi ponds. These are found in yards and parks. Koi ponds are usually part of a water garden. The word “Koi” is a homophone in the Japanese language that loosely means love, happiness, and affection. This is why Koi goldfish are a symbol of friendship and joy in Japan and why they are often given as gifts. Americans and Europeans have become increasingly interested in creating Koi ponds too. In fact it’s become quite a popular hobby and easy to do in most backyards with a few pond supplies. There is 1 goldfish that actually lived for 49 years in captivity. While perhaps not as loving as a dog or a cat, the relationship between a human and goldfish can become quite friendly. Goldfish care can be rewarding. Your fish can be trained to swim right to you and take food directly from your fingers. Some goldfish are so smart that they learn to do tricks. Watching goldfish swim in their tank or pond is relaxing after a hard day. In fact it can become addictive. If cared for properly, goldfish can live 20 years, although the average lifespan of goldfish that survive the first year in captivity is 7 to 9 years. Pond Plants – Why Are They Beneficial?